In 2016 I had the opportunity to cooperate with the Israeli channel TV2 – they asked me to help them with special dishes that are certainly worth a try, once you travel to Tbilisi. My list was quite long, and not all of my favourite dishes and restaurants were included in the program in the end, so I decided to share my tips here. Forgive me, my meat loving friends, but the food I am talking about is totally non-meaty. However, I’m sure you won’t regret following some of my tips. Let’s go explore the culinary scene of Tbilisi! 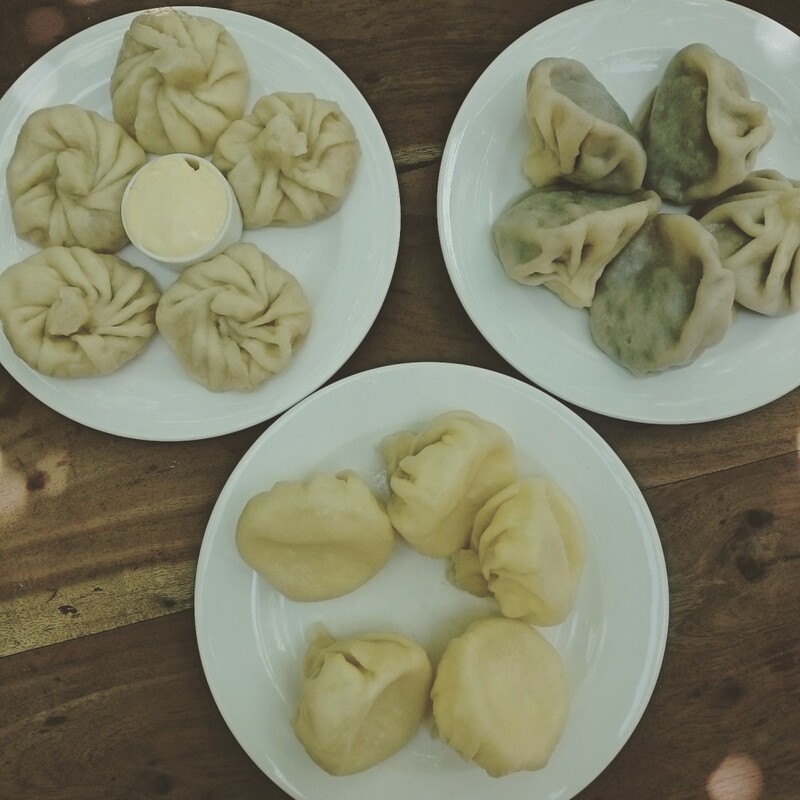 There are several restaurants in Tbilisi which are competing for the title of the best place for (meat) khinkali: for example, “Zakhar Zakharych” and “Pasanauri”. In my personal ratings juicy and spicy mushroom khinkali from the restaurant, which is hidden in the courtyard of the Museum of Literature, are the best. My stomach votes for them! Recently I discovered that some Western people call honey cake “Soviet cake”. It was quite hilarious, but also true somehow, as many Ukrainian and Russian friends of mine who are settled in Germany are actually missing this kind of cake (also known as medovik). So it might be related to that common period of our co-existence. Being not a fan of sweet pastry at all, I sometimes order a piece of medovik in a little cafe tucked in a corner between Saarbrücken (Vorontsov) Bridge and the embankment of Dedaena park. On a windy day this cake and a cup of tea are making up a good cheer-up team. 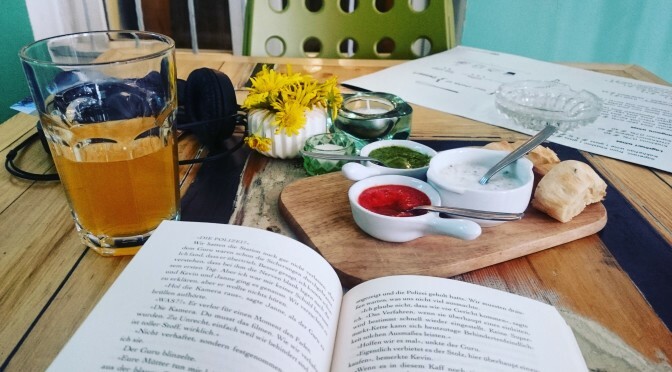 In the cozy cafe opposite the Anchiskhati Basilica, there used to be the shop full of oriental delights – you can trace it even now. Now Leila is a vegetarian restaurant with a fair choice of dishes. I send you there to taste several special Georgian things. The first one is “gobi”. The name of this round plate full of various Georgian appetizers is related to the word «megobroba» – «friendship». because it is almost impossible to share so much delicious food without developing affection to each other and the whole world. If you are meeting your friends, guests or potential business partners over a glass of wine, gobi is one of the best choices ever. 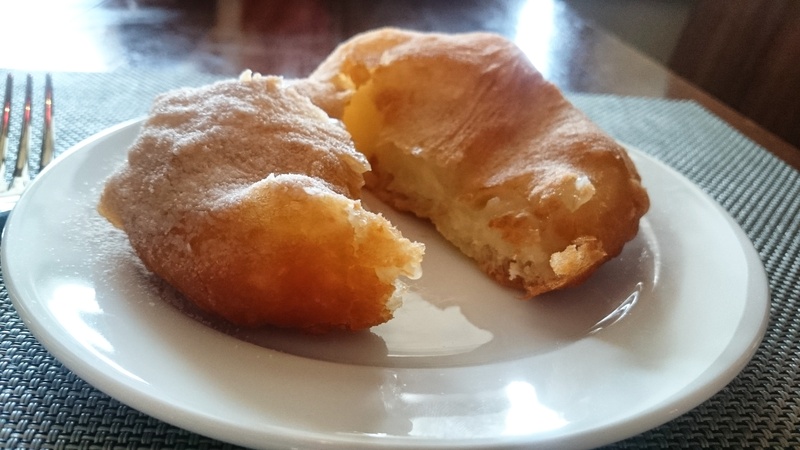 The other thing I recommend: sweets prepared according to the recipe of a noble Orbeliani family. There are very few places where you will find them in the city. And the Turkish coffee in Leila is something special, I don’t know how they brew it, but it tastes strong and tender at the same time! You won’t believe, but this restaurant is also not super obvious. That’s the essence of culinary adventures in Tbilisi – looking for the best corners with the best food. So you go to Sololaki district to find Geronti Kikodze street 16 (caution, it’s closed on Mondays! ), look down into the courtyard (which is “ezo” in Georgian), and dive into the menu, which is seasonal. The main idea of the restaurant is that all products are absolutely natural and produced either by the owners or purchased on small farms. I am always ordering assorted pkhali (especially the beetroot version) and mushroom chakapuli (mushrooms stew with tarragon and spices). However, my meat loving readers, I can tell you that a friend of mine, a very brave Georgian Georgian, ordered there simple grilled meat and almost cried with joy. And another person I know has been waiting the whole year for the season of lamb chakapuli to eat it in Ezo. So my advice is to go there, as you are in Tbilisi! Batumian battle for the title of master of Adjarian khachapuri between “Retro” and “Laguna” restaurants is unfolding in Tbilisi as well. 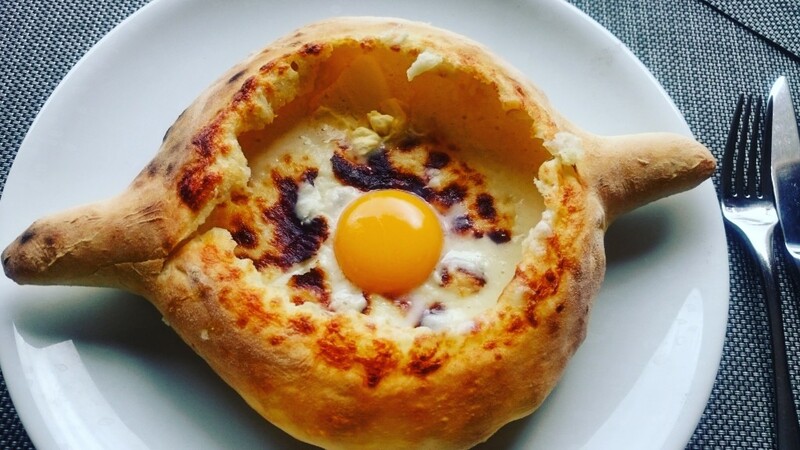 However, I recently fell in love with the boat-like khachapuri from the restaurant “Puri Guliani”, which is situated at the upper station of Tbilisi funicular. There you can try sweet local doughnuts and drink Laghidze lemonade. This combination is a typical Tbilisi thing. The locals overcome their famous “laziness” to go uphill because of these donuts! Such a sweet magnetism. Eating in the Cafe Gabriadze is not cheap, but I definitely like it because of their creative rethinking of the traditional Georgian dishes. For example, matsoni soup and mchadi (cornbread), which is served as a bagel with a layer of spinach pkhali inside is something which is calling me there during my lunchtime. 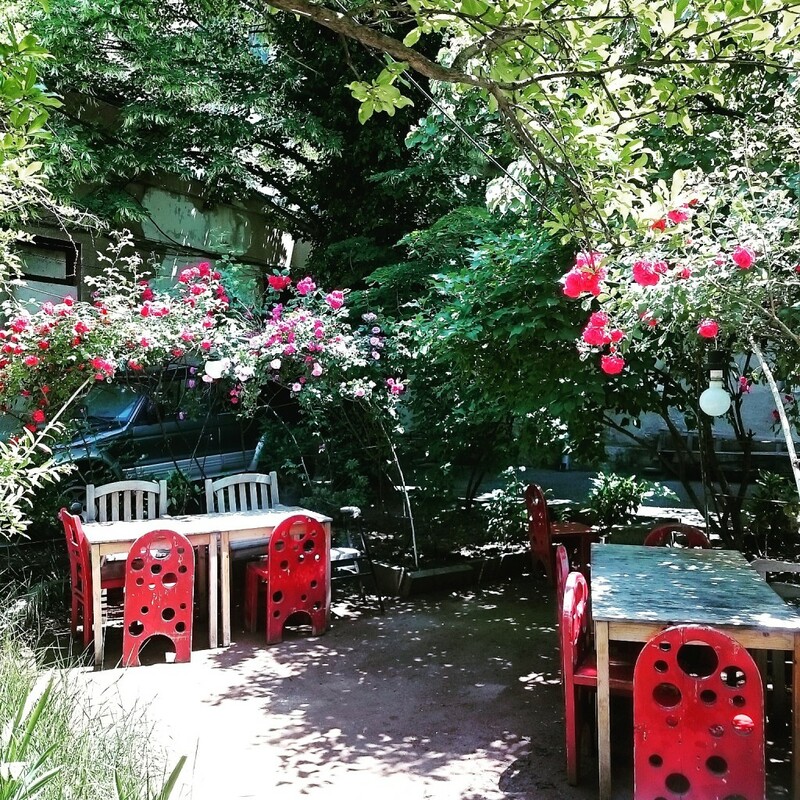 This restaurant was founded by a large family, which once discovered an old recipe book dating back to the XIX century under the authorship of Barbare Jorjadze, the noble lady who enjoyed cooking and stood for the women’s rights. The whole menu is based on Barbare’s recipes only. Some of them may seem too bizarre – such as cornel soup. But I liked it very much. If you are not afraid to experiment, try it out! Another must, the sweet and healthy pumpkin dessert will please absolutely everyone! The restaurant is situated in the basement at Agmashenebeli Avenue 132. If you enjoy drinking good wine from little private wineries and tasting rare Georgian cheeses, which are almost impossible to find in a supermarket, go to the Erekle II street and enter gVino. Some of cheese sorts are very rare – for example, dambal khacho’s preparation technology is a part of Intangible Heritage of UNESCO. Did I mention that I consider myself to be a latent Megrelian? I am so in love with the food of this Western Georgian region, because it is spicy as hell and makes you full as the moon. If not in Samegrelo region, I like to eat typical Megrelian dishes in Tashre. It’s not centrally located, but the way of preparation is as it should be. By the way, the program for Channel 2 is already on air! I’m the editor of Georgia Today newspaper and also a new tourist magazine coming out in Georgia called ‘Where.ge’. I was wondering if we could get permission to use all or part of this blog post (credited to you with the link , of course) and any other Georgia-related posts you might have. thank you for the late reply. Just found it in a spam folder, so sorry. I know where.ge, it is very nice. My office (GNTA) is also involved in production somehow. As I know there is also content from http://www.georgia.travel that is a product of my mind as well. But if you need more, please feel free to take it, if you can indicate the name of the author.